A magnificent example of two very rare species together in one, large cab. Schlossmacherite is named for a past president of the German Gemmological Society and is found only in massive form in Chile. It is the 'pistachio' green mineral in the cab, the bright blue being Ceruleite - a mineral that is often found in association with Schlossmacherite. The very attractive robin's egg blue shade makes for an interesting and lovely contrast. Very little of this material is worked as a gem material - we doubt you will see this elsewhere. 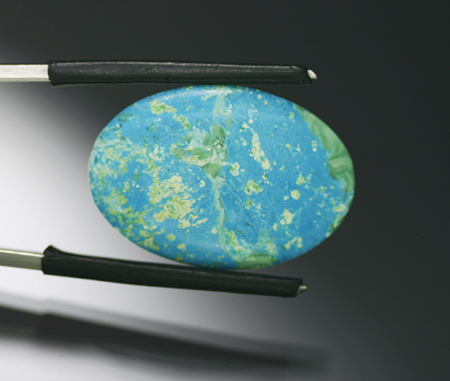 And, of course, with these colors and this shape, this great stone has a very planetary feel!